Never read a book like this. Studies show that management is the biggest obstacle in transition to Agile software development. I would go further and says management is the biggest obstacle in any major transformation. Management could ruin any effort made by subordinates and generates low motivation around them. Management 3.0 is a breath of fresh air. Because management is not easy, it urge you to think. This book is not a list of practices to apply but a captivating immersion in complexity theory. 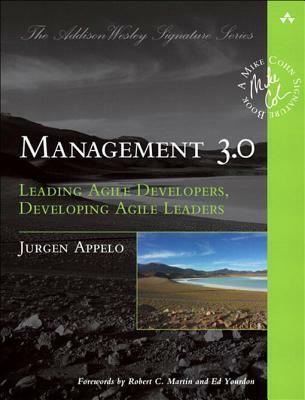 With Management 3.0, Jurgen Appelo synthesizes ideas and practices developed over a century and collected over the last 10 years. That’s just amazing. It’s clearly not the first thoroughly researched book I read (Quiet, Grit), but never a book has been so far in presenting so much information into so few pages. I really would like to know more about the process used to write such a masterly book. The Management 3.0 model is composed of six views, described in two chapters each, the first is more theoretical and the second more practical but don’t expect a recipe book. It shows you how to manage teams knowing that systems are complex, not linear, and how to focus on adaptability, not predictability. Nevertheless, it gives you plenty of techniques to translate theory into daily practices. If you are tired of seeing managers adopting the first idea that crosses their mind, never trying to understand how the things really works and where is the real problem to solve, buy this book, and put it in evidence on your desk. It doesn’t make much difference if you are a project manager, team leader, CTO, or if you work in the software industry or not. In the end we are all managers of the environment around us. Work could be a lot funnier managed that way. One final note: the book is funny too!